"Your company is the most dependable and fast. If you have it, I will buy without looking anywhere else. Keep up the great job." What is a HANS® Device? HANS stands for Head And Neck System. The HANS Device is technically known as a Frontal Head Restraint (FHR). It is designed to minimize the risk of serious neck injuries in an auto racing crash. 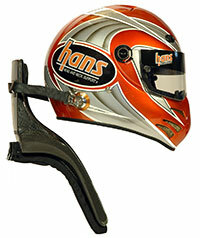 The body of the HANS Device is a rigid collar worn under the shoulder harness belts. Flexible tethers connect the collar to the helmet. How does the HANS Device work? In an impact, the HANS Device tethers limit the forward motion of the driver's helmet. This also transfers the tension load from the neck, which is very fragile, into a compression load against the forehead, which is considerably stronger. I don't go fast enough. Do I really need a HANS Device? Studies show that serious head and neck injuries occur at impact speeds as low as 35mph. These speeds are common in all types of racing. It's not how fast you go, but how fast you stop. Do I need to buy a new helmet or is a special helmet required? No, the helmet anchors fit any Snell-approved helmet that is proper for your sanctioning body or track. Does installing the helmet anchors involve drilling holes in the helmet? If so, what does that do to the Snell Rating? Installing the helmet anchors may involve drilling holes in older helmets. The Snell Foundation has stated that so long as the drilling is done outside of the test zone, it does not affect the helmet's certification. The anchors used for the HANS Device are not in the test zone. All Snell SA2015 helmets are required to have M6 threaded inserts already installed in the shell. Snell SA2015 and SAH2010 standards also test the integrity of this area of the shell. Each HANS Device kit includes all necessary helmet anchor hardware and installation instructions for easy do-it-yourself installation. What type of race harness should I use? Are 2 inch better than 3 inch? We recommend any FIA approved or SFI certified race harness for use with HANS Devices. Some manufacturers are marketing special 2 inch shoulder straps for use with the HANS Device, but these are not required. The HANS Device was designed for use with 3 inch belts. HANS only tests with SFI-certified 3 inch harnesses. My shoulder straps come off the HANS Device, why? Properly mounted straps do not come off of the device. If your shoulder belts will not stay securely over the device when you are firmly belted in, chances are that you do not have the shoulder belt mounts properly located in your chassis. Check the belt mounting directions supplied on the Quick Start Guide and be sure that your belts are mounted correctly. If this problem persists after the belts are properly mounted, contact us. I can touch my chin to my chest with the device on. Is this a problem? No, it's not a problem. The HANS Device allows a great deal of mobility while still reducing the chance of injury. In an actual impact, the HANS Device will stay with the shoulder belts, while your body slides forward under the belts and HANS Device until the tethers straighten. The slack in the tethers is taken up before the belts restrain your torso, the HANS Device, and the head together. Can I share a HANS Device? Provided that you are of similar physical size and shape to your partner, chances are good that you can share a device. Both of you will need to have HANS anchors installed on your helmets. Can I wear a foam collar or helmet support with a HANS Device? Yes. Note testing has shown that a foam collar, or helmet support, adds weight to the helmet and the head that must be carried by the neck. This increases the chance of injury. This added weight is carried by the HANS in a crash. Wear a foam collar for comfort, not safety related reasons. How do I care for my HANS Device? HANS Devices should be kept clean and dry. Extreme hot or cold environments should be avoided. Your HANS should be kept away from petroleum products or other corrosives as these can have unexpected results on even the strongest composite materials and resins. HANS Devices should be stored out of direct sunlight or in a bag. They may be cleaned with warm soapy water. What if my HANS Device is in an impact? Like all driver safety equipment, HANS Devices should always be inspected after an accident. In a simple self-inspection in direct sunlight or a similarly bright light, users should look for signs of de-lamination, surface cracking and exposed composite material under the finish. Damage sometimes can be felt, but be careful of protruding fibers. However, even the most thorough visual and manual inspection and strength testing can fail to detect damage. This is one of the reasons that we do not resell used devices, and we do not recommend that anyone buy a used device. If in doubt about the integrity of a HANS Device, it should be replaced. At a minimum, the tethers should be replaced. What is the difference between the different series? The HANS III Series uses injection-molded carbon fiber for the lowest cost at a slight weight penalty (about 1.5 pounds, still less than most helmets). The Professional models are all made up of high modulus carbon fiber and performance resins to achieve lighter weight while maintaining strength. The original Pro Series has a high backboard to prevent submarining under the headrest. The Pro Ultra Series has a lower, rounded backboard to reduce weight and make vehicle exit easier. The latest Pro Ultra Lite Series has the same low backboard and shaves even more weight. The Adjustabe Model is unlike the others, with a magnesium alloy skeleton that allows you to change the backboard angle. How often should the tethers be replaced? The tethers should be replaced whenever involved in a crash, torn, frayed, worn or at a minimum of every 2 years regardless of condition. Do I need a different HANS Device for each helmet? No. As long as each helmet is fitted with the proper anchors, you can use one HANS Device with multiple helmets. When should I replace my HANS Device? Snell recommends replacing competition helmets every five years. HANS Devices are made with similar materials and resins. They are also exposed to similar environments. Snell's five-year rule for helmets is only a guideline, but it is one we think users should consider when reviewing the integrity of a HANS Device. The form of racing in which a user competes may also dictate the timeframe for replacing a HANS Device, especially if a user competes in open cockpit environments. Even the best materials deteriorate over time. Further, we recommend a user replaces their HANS Device if it is involved in an accident or shows any signs of structural damage. If in doubt about the integrity of a HANS Device, it should be replaced. What else can I do to make my racing safer? 1. Understand that any head restraint device should only be a part of a larger driver safety system, ideally incorporating a containment seat, 6-point harness, and head nets to keep the driver's head positioned properly relative to the torso. 2. Practice exiting the racecar in an emergency. What will you do if you have a fire or have to exit from the passenger side? Have someone time you exiting the car in a mock emergency with a stopwatch. The quicker the better. Are the folks that I deal with at Pegasus factory trained and authorized to sell the HANS Device? Yes. Nine Pegasus employees have gone through factory training conducted by an expert from HANS Performance Products. This article was first published on 3/10/2009. It was most recently modified on 6/1/2016.